This box makes my cat look like she's wearing a top hat. Sold. Each player chooses a color and places all of the locomotives of their color as well as that color's character card near them. Randomly select either the Chicago, St Louis or Cincinnati to be the starting tile and place it face up in the middle of the table. Draw good cubes equal to the number shown and place them on the tile. Return the other two tiles to the pile of facedown city tiles. Randomly mix the city and stock tiles separately. Give each player two facedown city tiles. The remaining city and stock tiles will form two draw piles. Take the character cards from each player, shuffle them and deal them left to right to create the initial player turn order. Turn order is from left to right. Place a locomotive from the 1st player on the 6 spot of the scoring track, a locomotive from the 2nd player on the 8 spot, and so on with each player starting 2 points higher than the last. Place a number of goods cubes in the bag based on the number of players. 1. Draw Tiles/Bid for Turn Order: Draw tiles equal to the number of players from each pile and place them face up near the middle of the table. Each turn (except the first) the players will bid to see who becomes the 1st player. Starting with the last player, the players may bid more points than the previous bid or pass. The bidding continues until all but one of the players have passed. The player who made the highest bid pays the amount bid by moving their train on the scoring track and moving their character card to the 1st post. 2. Draft Tiles: In turn order, each player selects either a city or stock tile. Once players make their selection, they each select a second tile of thr other type. Place your new tiles in front of you, stock tiles face up and city tiles face down. 3. 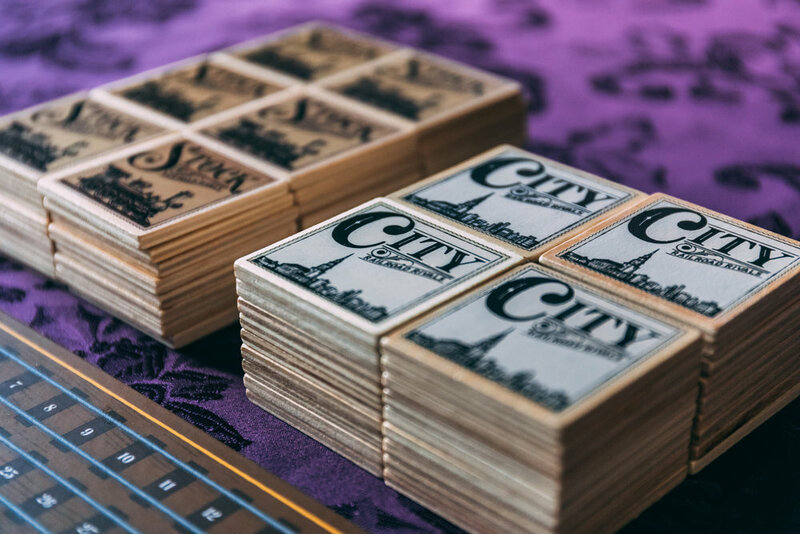 Place a City Tile: In turn order, each player will take a turn placing one of their city tiles next to a city tile that was already placed. The railroad edges of the city tiles must match. 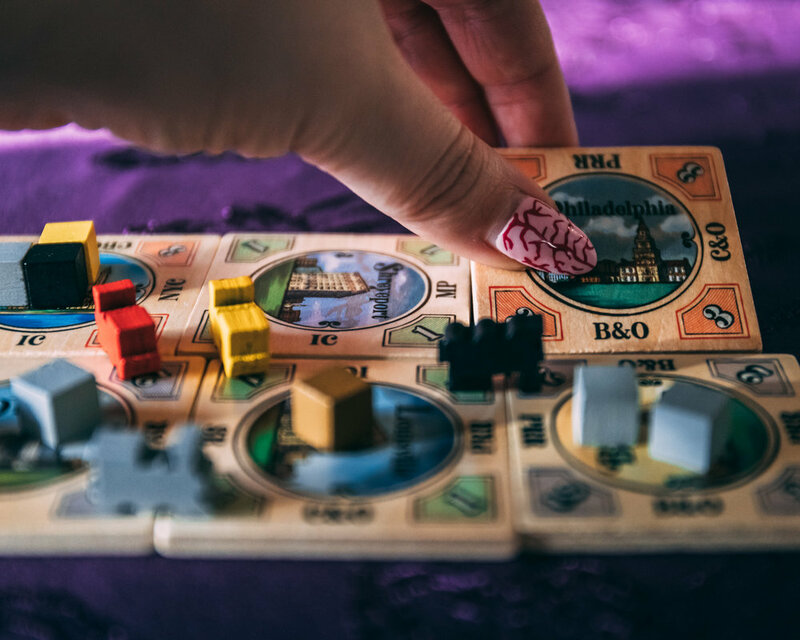 Place one of your locomotives across the two tiles next to the matching railroad names and draw goods cubes equal to the number on the corner of the newly placed tile and place them on that city tile. 4. In turn order each player will deliver one goods cube. Choose a goods cube on a city tile and deliver it using an existing link. Take the goods cube off the city tile, declare which link you are using and lace the cube on the table to show it was delivered. After all delivered cubes are scored, the cubes go back in the bag. If the link used the make the delivery is not owned by the acting player, the owner of the locomotive scores 2 points. The value of the railroad stock for the railroad used goes up 1 point. When a player places their last city tile, the game ends when that player's turn is complete. Player's score points for each stock they own based on the railroad's current value on the stock track. Add these points to the player's score track and the player with the most points wins. The production value is pretty good. I'm not sure what comes in the basic version of the game but the deluxe copy of the game comes with high quality wooden components. It will be a long time before you start to see wear on the tiles. The only components that didn't come as high quality wooden pieces are the character cards which came instead on thick cardboard. Personally for consistancy I would have loved to see these as wooden components too but it's not a dealbreaker. The character cards are double sided so no matter which color you choose, you get to play as the gender of your choice. I liked that the rulebook had plenty of photos to back up the text and make the instructions more clear. The rulebook was decent but had some minor flaws. For example, we weren't sure where the stocks were supposed to start during the setup. The rules are quite simple but for some reason they sound really complicated at first. When explaining the game to new players I found it much easier to understand when I provided examples of each phase of the game. The games went by quickly (under an hour). It's generally pretty easy to know what your next move is by the time your turn comes around. Since there is only a few options to choose from in each phase it's best to think of a back up plan in case things don't go your way. Ultimately it's one of those games where the length of the game relies on how long players take to make their decisions. I enjoyed the mechanic of bidding points for first player. A player will not want to scarifice points in every round of the game so it is unlikely the same player will remain first player for too long. I'm glad the tiles are revealed each round prior to bidding for first player so you don't spend your points on choosing tiles that don't matter to you. Tile placement can get a little competitive. Since I had the most NYC stocks, my opponents kept blocking off those connections so I was unable to raise the NYC stocks. This was really frustrating and forced me to change my strategy completely. Another player struggled through the first few rounds of the game as they were unlucky and not able to make any connections. You have to be very vigilent when drafting because of this. You'll want to share matching stock tiles with at least one other player so that you have incentive to work together. I'm not sure how I feel about the delivering goods phase. It didn't appear to have a huge impact on the point spread as more often than not players were able to move goods using their own connections. It does help provide you with points for the auction phase so it still seems necessary. I felt satisfied with end game scoring. It was fun to tally up stock points at the end to see how well you had done. I'm not sure of the solo mode. When I played a solo game I completely dominated without it ever feeling like a challenge to me. I'm not sure if I messed up some of the modified rulings for a solo game (It's entirely possible). I did read the solo rules again but I couldn't figure out where I might have gone wrong. I won't say to throw out all your other train games to replace them with this one but if you're looking to add more train games to your collection this one is worth considering. The length of the game and it's simplicity make it great for new gamers, someone with kids (8+) or anyone who enjoys light to medium weight games. Always check our your local gaming stores first otherwise you can take a peek at the links below. As always thank you for reading and feel free to leave your questions, comments and thoughts below.